Most people associate the word “cleaning” with long afternoons of scrubbing, sweeping, vacuuming, and other arduous tasks—none of which are most peoples’ idea of a good time. Unfortunately, it’s something we all have to do, unless we a) enjoy living in our own filth, or b) have the resources to afford a full-time house cleaner. On the bright side, cleaning doesn’t have to be so gruelling. In fact, it can even be enjoyable if you go about it the right way. With all that being said, we’re excited to present to you our guide to making cleaning fun! Most people would rather be out socializing than at home cleaning, but why not do both at the same time? Time flies a lot faster when you have somebody to keep you company. Get the whole family involved, or invite a friend over to help. Guaranteed they’ll be willing to lend a hand if you volunteer your own help next time they’re doing a big house clean! With the right playlist, any activity can be turned into a dance party—cleaning included! Pick some upbeat and motivational songs, and sing as loud as you can! Fun tip: a broom handle makes the perfect fake microphone stand. Everything gets boring after doing it for hours, after hours, after hours. Reward yourself with short 10 or 15 minute breaks every time you finish a major job to break the task up. Even better, reward yourself with something like snacks! Whether you’re cleaning by yourself or with a group of friends, a good natured challenge is always a good way to get geared up. For instance, why not have a contest like who has the best aim when throwing trash into the garbage, or a vacuuming race? Another idea is running a fake cleaning game show, where you set a timer and see how many items you can pick up off the floor in a set amount of time. The most fun part about cleaning is seeing your progress. If you’ve got a huge mess on your hands, it can be hard to notice the difference your cleaning is making. Clean big surfaces first—for instance, clear off the kitchen table, and make your bed. 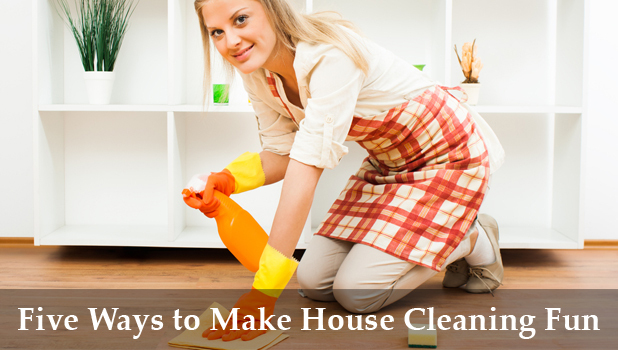 This way you’ll start noticing how much cleaner your house is looking right away! So What if I’m a Neat Freak?